Norway announced this week the launch of a conceptual public toilet located on the edge of a fjord on the west coast of the country. 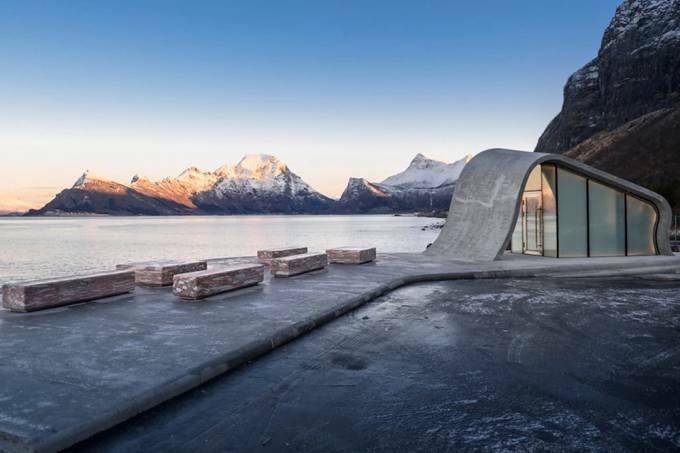 Named after Ureddplassen, the bathroom is shaped like a wave and features a terrace overlooking the Lofoten archipelago in the Norwegian Sea. “Ureddplassen is a place for a short stopover, a rest, a picnic or for long evenings with the midnight sun and the northern lights,” explained the Nasjonale turistveger, a tourist service in Norway, on the scenic route of Helgelandskysten, where the bathroom was installed. Whoever stands in line to use the bathroom can sit on one of the benches made of Norway’s pink ivory, the same stone used in the construction of the United Nations building in New York. The project is from the architects of Oslo Marit Justine Haugen and Dan Zohar. “The view of the place is unique and the places are protected from traffic noise,” said Steinar Skaar, Helgelandskysten route manager, the longest of the 18 routes of the type in the country, in an interview with The Telegraph newspaper. The Helgelandskysten route starts in the town of Holm in the south, passes through the Arctic Circle, and heads to Godøystraumen in the north. To complete it, it is necessary to make six ferry crossings and to cover 416 kilometres. The parade also serves as a memorial honouring 42 Norwegians killed in February 1943, when the submarine where they worked sank after colliding with a mine left by a German ship during World War II.